Kim and Mark G a little damp! 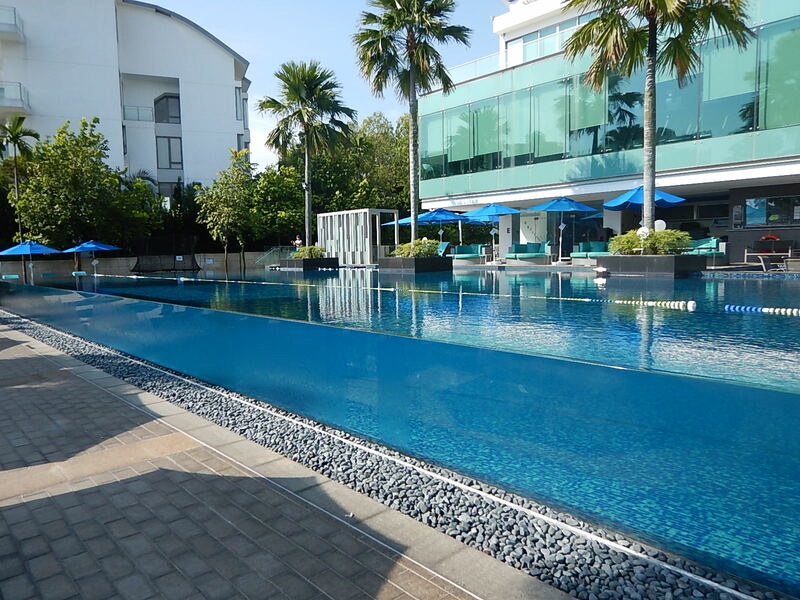 After the bustle and unfamiliarity of Indonesia it was nice to touch down in Singapore which is much more westernised than Yogyakarta and Surabaya, cleaner, and more familiar as we have been there before. 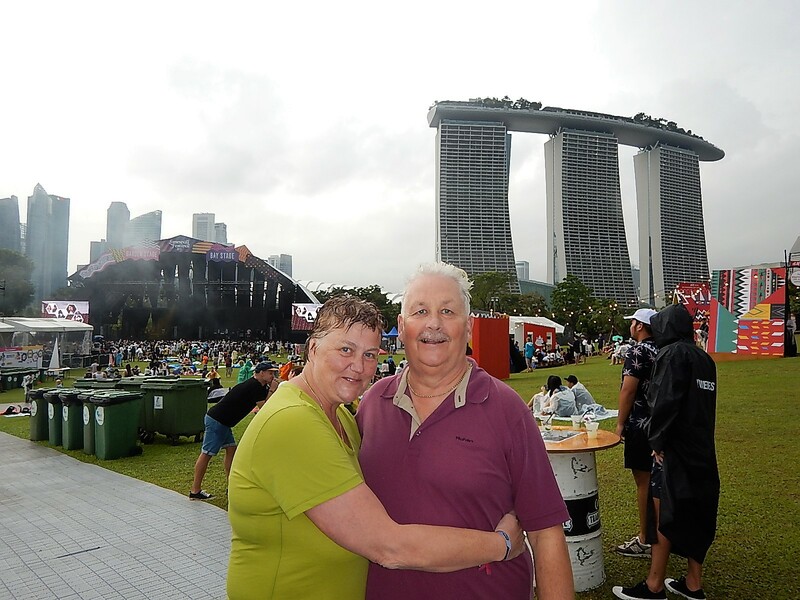 We were looking forward to a chance to catch up on some domestic chores; laundry, haircuts, travel arrangements for our trip across Europe; and also, to catching up with our friends Mark and Jennifer who live in Singapore. 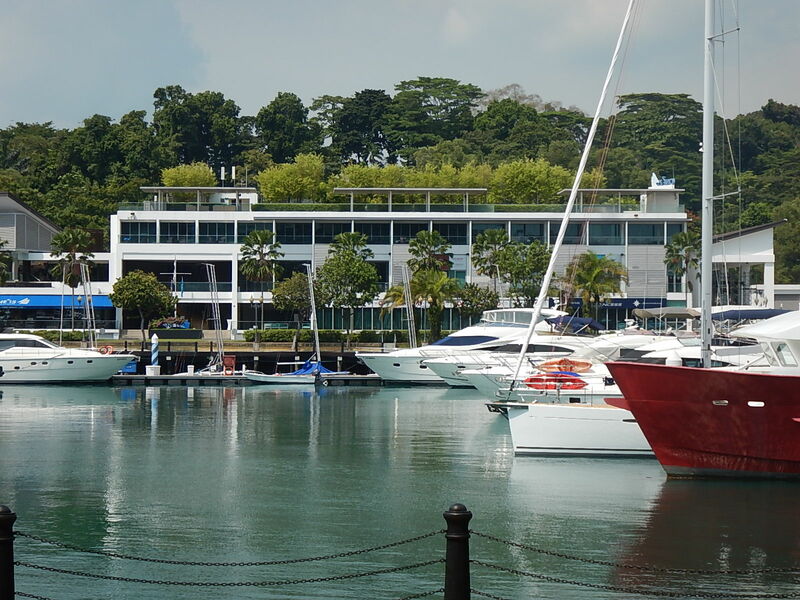 At their suggestion we had booked into the One 15⁰ Marina Club on Sentosa Cove just west of downtown Singapore and very close to where they live. We had a very comfortable room with a balcony overlooking the marina. Our hotel from across the quay. We managed to complete all our tasks as well as spending time with Mark and Jennifer and doing some touristy things too. Under our own steam we took the MRT (underground) down to the Bayfront where we visited the Gardens by the Bay, a botanical garden development including two ‘Eden Project’ style domes. One has displays of tropical and temperate flowers and the other a rainforest presentation in the form of a mountain and massive waterfall. Both domes were beautifully air conditioned and it was nice to do some sightseeing without getting cooked in the process. From there we headed to the Marina Bay Sands hotel which has a magnificent viewing platform on the 56th floor. The views were spectacular and we spent some time trying to work out the course of the F1 Grand Prix track which loops around the marina below. That night we met Mark and Jennifer in Chinatown for a meal at one of their favourite restaurants, Crab Song, which serves Singapore’s signature dish Chili Crab, whole crab cooked in a sweet chili sauce. The waitress brought us bibs and plastic gloves and we tucked in. The chili crab was excellent, as was the black pepper crab we ordered for comparison. After dinner Mark said he had booked somewhere for ‘dessert’, we dutifully followed him down the road, then up a set of slightly dodgy looking back stairs and a sign saying ‘traditional Chinese massage’. Sure enough ‘dessert’ was a foot and shoulder massage, we all sat in comfy armchairs while a team of Chinese masseur provided a very thorough massage. We all left walking on air, what a great way to follow-up a good meal. 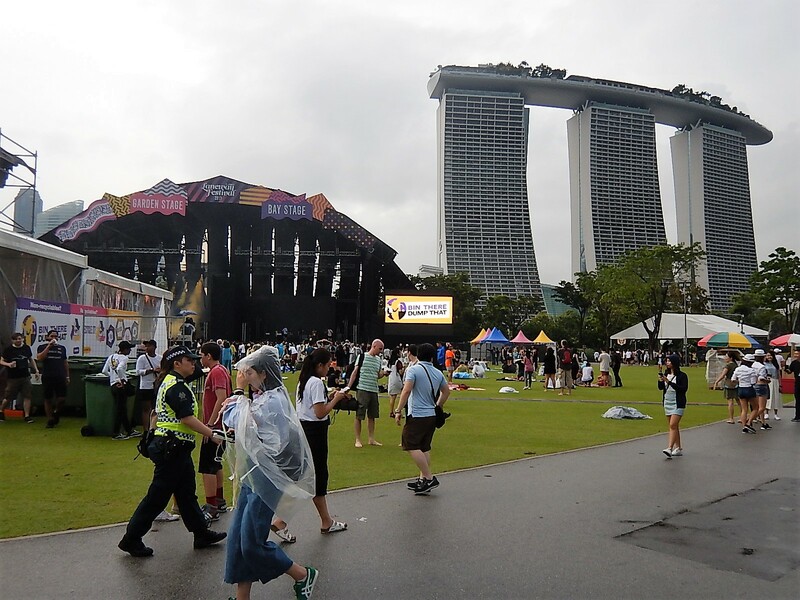 On Saturday Mark had arranged tickets for the Laneways Festival in the gardens by Marina Bay, it had been raining all morning but it seemed to be easing off as we drove to the festival site by taxi. Actually, it wasn’t easing off, we were just moving ahead of the downpour, it caught up with us just as we got to the site. Undeterred, and taking shelter for five minutes during a particularly strong downpour, we headed for the entrance planning to buy ponchos when we got there. They had sold out. By this time we were pretty wet, warm, but wet, so we decided to give up trying to keep dry, buys some beers and go and enjoy the bands. 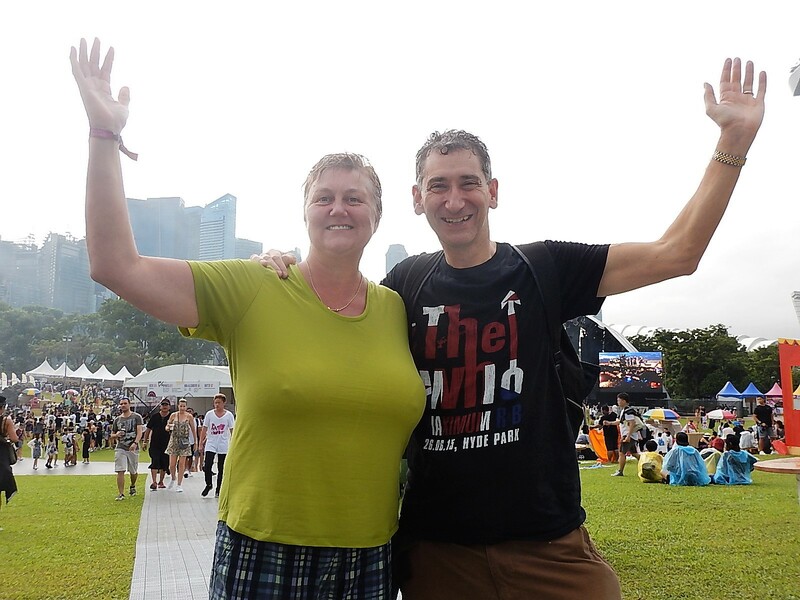 The music was good but after a couple of hours we were drenched and there was no sign of the rain relenting; Mark reluctantly called Jennifer (who had wisely opted out of the event) and asked her to load the car with towels and come and pick us up. We headed back to the hotel for a hot shower and then reconvened for a delicious meal in the Chinese restaurant downstairs. Wet! You have no idea. Other entertainment during our stay in Singapore included an excellent BBQ at Mark and Jennifer’s home by the river; and sitting on the balcony watching a flotilla of sailing dinghies preparing for a regatta in the bay, setting sail each morning to compete and coming home in the late afternoon to tie up. As ever our time in Singapore flew by and before we knew it we were waiting for a driver to pick us up for our journey to Malaysia. Many thanks for the great photos of the exotic flowers – very impressed! Cheers and hope you are both well.